The North Head Historic Reserve is New Zealand’s most important military base and coastline security. 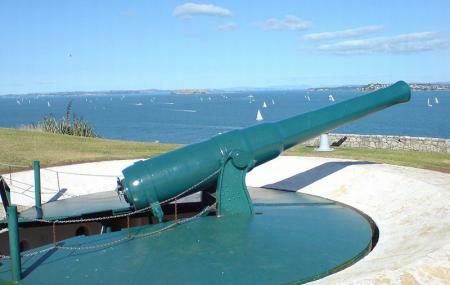 Even today, the military tunnels, gun emplacements and fortifications dating back to late 19th century, are preserved. You can take a walk here to admire the splendid coastline as you explore its many pathways. Fun fact-North head is one of the 50 volcaniccones in Auckland. The North Head beach is rather popular for its serene ambience. During your visit, don’t miss on seeing the film about the history of North Head shown at the old stone kitchen. Camping and littering is not permitted. The reserve is open at 6:00 am. Vehicle gate closes at 8:00 pm. Pedestrian gates at Takarunga Road and at the southern end of Cheltenham Beach close at 10:00 pm. For tours, contact the place prior to your visit. Timings of the Stone Kitchen: Daily from 8.30 am to 4.00 pm. How popular is North Head Historic Reserve? People normally club together Waitakere Ranges and Museum Of Transport And Technology while planning their visit to North Head Historic Reserve. People also prefer to end their day with North Head Historic Reserve. What fun we had, and in the wet weather too, exploring these tunnels! I'd recommend taking a torch so you can feel safe with your footing inside the darkness. It was a rather steep climb up the track... but coming back down we went via the road, which was much quicker and easier (just watch out for upcoming cars). Historic, interesting and fun all at once. Don't forget to watch the video up top in the stone building so you get an overview of North Head then and now. One family were even having a picnic in one of the bunkers... great idea! This place was amazing, was really awesome to check it all out and see the tunnels from back in the day. Was a shame about the rubbish/ urine smell in some of the rooms of the tunnels. Some people let it down for the rest of us, but that aside it was so cool to go through here and see a part of our history. Was cool to show the kids the guns and gain knowledge of what happened here. Great citywide views at the top, and around the edges of the mountain are a couple of beaches and various rocks to fish off. Tunnel system is interesting and a lot of history information boards are shown around the place. A great and free location point of interest for tourists and locals alike. A Wonderful place to spend some time. There are some tunnels and Cannon's if you are interested in historical stuff. It's a place you can enjoy a nicer view of the city of sails. Also it has a beautiful beach you can have a nice swim in the summer. Great day. Started at the wharf and took a leisurely walk up and back. Kids loved the canons but the view is amazing and a history lesson for us all. Take a torch as one of the tunnels is pitch black. Quite eerie but fun and interesting.